Oh no! It’s happened again. Fido had an accident on the carpet and you didn’t see it until just now. Who knows how long its been there and why they did it. But now its there and you have to clean it up. Every pet owner has been in this situation and cleaning the stained area can be a nightmare if you don’t have the right carpet. 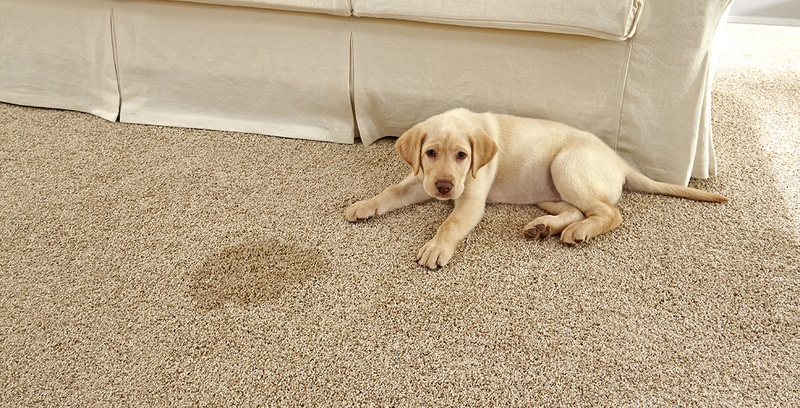 Fortunately, if you have one of our carpet products, cleaning this stain is going to be a breeze. Step 1: Blot the stained area. Don’t rub the stain or scrub too hard. Just gently blot the area and if the accident is fresh it will come right up. Step 2: Use dish soap and warm water to gently clean the area after absorbing the liquid. Step 3 (if necessary): If the liquid or stain has really stuck to the carpet you can use 10% bleach mixed with 90% water. 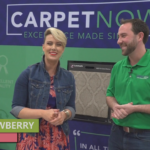 Our Level 2 and Level 3 carpets are solution died which means bleach won’t cause the carpet to fade! 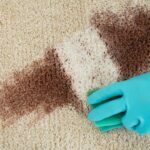 Step 4 (if necessary): When all else fails, have a professional carpet cleaning company visit your home and treat the affected area. Most companies offer spot treatments so you don’t have to pay for your entire home to be cleaned if you only have a few spots that need attention.